I saw this movie shortly after it came out because for one I wanted to see Streep and Tucci teamed up again past Devil wears Prada. They are darling together. Then my sense of memory took over. 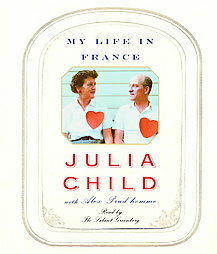 My mom had numerous cook books by Julia in my youth. Tear outs from magazines pamphlets. All wonderful of course. I have had to learn to cook as an adult this year, now being single again and this movie (and now book) inspired fearless attacks at my oven. The love story is really the best part. After watching I did go out and get “My life in France”. Wonderful and beautiful. I hope you enjoy it !